Pictured (l-r) Rob Tucker, Jennifer Childs, Sean Close, Dave Jadico, Jenson Titus Lavallee and Susan Riley Stevens. Your enjoyment of this year’s edition of 1812 Productions’ annual satirical revue, “This Is The Week That Is” may very well depend on what you are expecting going into it. Given that the 20-year-old troupe—America’s sole theatrical company dedicated exclusively to the comedic arts—is populated by some of Philly’s Phunniest Pholks, you wouldn’t be wrong to anticipate an evening of eye-tearing, side-splitting belly laughs. But if you do, you’ll probably be mildly disappointed. On the other hand, if you can be satisfied with a steady stream of chuckles sparked by shtick that is alternately smart and silly, then “This Is The Week That Is” is for you. 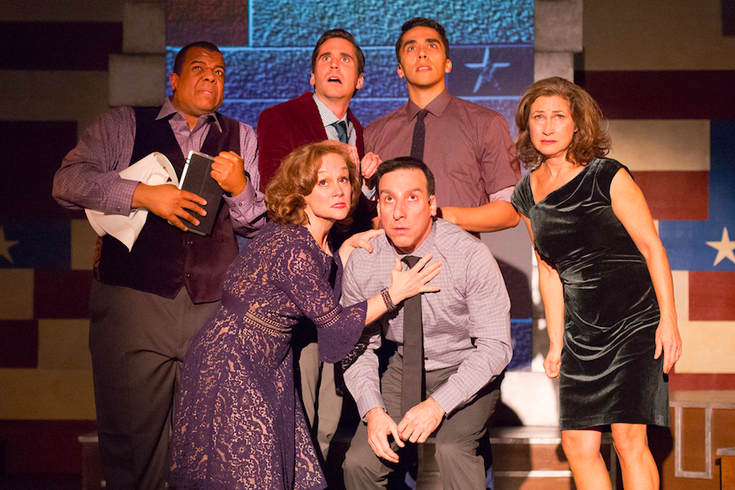 The main problem with the comedy-with-music program that runs through New Year’s Eve at Plays and Players Theatre is its insistence on shooting fish in a barrel, and fondness for preaching to the choir. Despite the holiday timing of the program, TITWTI is not a Yuletide cavalcade, but two hours (not including intermission) of political and pop culture commentary with a decidedly liberal bent. So, it’s not surprising that President Donald Trump hovers over the production like a Macy’s parade blimp. Granted, pointing out the never-ending tsunami of horrors perpetrated by the Trump administration is not such a bad thing (if you’re so inclined, politically speaking). It’s just that, too often, the six-member ensemble led by 1812 co-founder Jen Childs covers territory that is trod incessantly by Trevor Noah, Stephen Colbert, John Oliver, et al (suffice it to say that the “TITWTI” cast works blue, as in the Democratic party). More importantly, there is no single line or characterization that causes audience members to scream like demented hyenas or clutch their sides in delicious, laughter-induced agony. 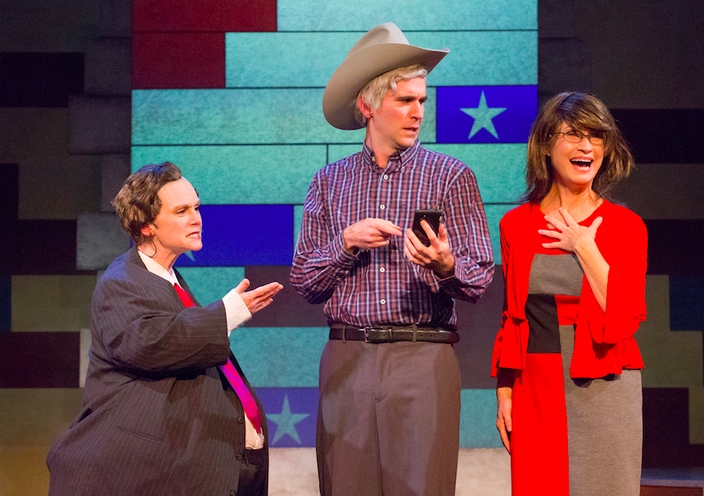 Pictured (l-r) Jennifer Childs are Chris Christie, Sean Close as George W. Bush and Susan Riley Stevens as Sarah Palin. Perhaps it would have been a good idea for the troupe to mine more vigorously the fortunes and foibles of the Delaware Valley for comic gold: When they do, as in the sketch based on Philadelphia’s campaign to land Amazon’s so-called “HQ2,” or the de rigueur appearance by Childs’ nasal alter-ego, the South-Philly-through-and-through Patsy, things definitely accelerate. From the sad state of Philly schools to the 76ers and their “Process” to the apparent, imminent resurrection of disgraced ex-State Sen. Vince Fumo, there is more than enough local fodder for the team’s comedic canon. Another issue is the running time. The show would probably work a lot better if it were presented in one 90-minute act, rather than two 60-minute halves. Yes, there is enough material that could be cut without doing harm. Nonetheless, there are countless moments that result in genuine, if not over-the-top, laughter. In addition to the two above-mentioned segments, there is the funny “curtain speech” business that launches the proceedings, the faux “In Memoriam” shtick that featured a video scroll of the dozens of Trump administration members who have either been fired or resigned the past year and, especially, numerous one-liners delivered by Sean Close, who anchors the faux news report that occupies all but a few minutes of the second act. Even when the material lags (as in the set piece portraying an Internet TV show hosted by a couple of female senior citizens), the individual talents of the cast are always front-and-center. Childs, who deftly directs the show, and Close are matched step-for-step by Jenson Titus Lavallee, Susan Reilly Stevens, Rob Tucker and the gloriously goofy Dave Jadico. Individually and collectively, the sextet of performers never flags, and their many gifts help carry the day. Plays & Players, 1714 Delancey St.; 6:30 p.m. Wednesday; 8 p.m. Thursday-Saturday; 2 p.m. Sunday (dark Dec. 24); $45-$28; 215-592-9560.